Sure you can. You just need to understand what makes the ball fly low, and what adjustments will achieve the correct launch properties. So, how are some golfers able to hit penetrating, laser-like shots that rip through a gale and reach the green? By de-lofting the clubface at impact. Their hands are ahead of the ball, the shaft tilted toward the target, the club approaching the ball on a descending angle with the face square. Ball back in your stance: A foolproof method for de-lofting the club. Simply play the ball an inch or two farther right in your stance, but don't go beyond the center of your feet. (You'll risk coming in too steeply.) The key is to keep your hands in the same position as you would for a normal shot – level with the inside of your left pocket, for instance – and make sure the clubface is square to the target line. Your normal swing should produce a lower trajectory. More club, less power: “When it's breezy, swing easy,” goes one of golf's most useful clichés. The worst thing you can do when playing into the wind is to force the issue by swinging harder, which adds backspin and height. Instead, play more club (a 7-iron instead of a 9) and make a smooth swing at 80-90% power. A low, boring shot with minimal spin will result. Stand farther away, finish low and around: Low-ball hitters usually have flat swing planes. A couple of quick adjustments will flatten your swing when the situation warrants. After taking your stance, shuffle back an inch or two from the ball while maintaining good knee flex. (Don't bend over to reach the ball.) As you swing, visualize finishing with your hands at shoulder height and the club parallel to the ground. You'll strike the ball at a shallower angle with an inside-to-out path. Drilling waist-high punch shots may seem like an exercise in futility, but don't give up until you've tried these tips. It's a lot easier than you think. There is plenty of golf instruction to be found on the topic of hitting the ball higher. Along with adding distance, adding height to their shots is one of the top goals of many players. Of course, there is a lot to like about higher shots. When you hit the ball high in the air, you can carry it a great distance toward the target, and the shot will usually stop quickly as well. It is not a coincidence that many of the best golfers in the world own impressive high ball flights. With that said, hitting the ball low from time to time is beneficial as well. When you keep the ball down low to the ground, you are able to avoid the wind to a large degree, and you will usually be able to keep the ball on line as well. Taking the low route is not always going to be the right choice, but it will pay off for you in many different circumstances. A well-rounded golfer is one who can produce both high and low shots depending on the challenge they face. This is not a skill which is reserved only for professional golfers, either – any amateur can work on learning how to hit low shots simply by making a few mechanical adjustments. In this article, we are going to highlight three different ways in which you can produce a low golf shot. By giving you three options, we will make it more likely that at least one of them will work nicely for you. It may be that you find one of these to work better than the rest – or you might find that they all work for your game. Give them a try on the driving range and stick with the ones which are most effective. It is a good idea to add at least a few low shots to your standard practice routine. If you can set aside even just five golf balls during every practice session to work on your low flights, you will gradually get better and better at this skill. You need to build up your confidence in this kind of shot on the range before you actually give it a try on the course. Just like any other shot in this game, you need to know what to expect from your low ball flight prior to being able to use it effectively during an actual round. Reduced swing speed. By reducing the effective length of the club, you will be lowering your overall swing speed. When all other things are equal, a lower swing speed is going to equal a lower golf shot. This is why most of the long hitters in the professional game are the same players who can hit the ball way up into the sky. Since you have made this adjustment pre-swing, you don't have to think about it once you put the club in motion. Forget all about the fact that you have choked down and simply make your best swing. Your swing speed will naturally be reduced, and the ball will fly a little lower. Reduced backspin rate. In addition to cutting down on your swing speed, you are probably going to cut down your backspin rate as well when you make this adjustment. Backspin is largely responsible for sending the ball up into the air, so lowering your spin rate will lead to a flatter flight and a lower overall shot. There are a couple reasons your spin rate should come down thanks to choking down on the grip. First is that swing speed reduction we mentioned above. Without as much speed through the hitting area, you won't impart as much spin on the ball as you would have otherwise. In addition, choking down is going to lead to a flatter swing through the hitting area, meaning you won't hit down enough to create a high spin rate. This is not going to be the right approach for all shots, but it can definitely work in certain situations. Shorter backswing length. Finally, your swing will likely shorten up a bit when you use less of the club. A shorter backswing will contribute to the speed loss, but it will also help you to control the club nicely from start to finish. You will probably find that you hit the ball on the sweet spot more often while choked down on the grip, and finding the sweet spot is always a good thing. So far, so good. By making just a simple pre-swing adjustment, we have effectively lowered your ball flight. This is a technique that can work for almost any golfer, and it requires very little practice. Hit just a few balls on the range while choked down on the grip and you should be good to go. This is a shot that all golfers should have in their back pocket so it can be pulled out at just the right time. If this method is so easy to use, why do we even need to go on with the rest of the article? Well, there is one problem with this method – it doesn't actually bring your ball flight down that much. Yes, your shots should be lower, but only by a little bit. The ball flight will come down closer to the turf, but it's not like you are going to be hitting low line drives all over the course. The ball will still get up in the air when struck cleanly, and it will only fly a bit lower than a standard shot. To hit the ball significantly lower, you are going to need to move on to other adjustments. If simply choking down on the grip of your club is not going to make enough difference to bring the ball down far enough, the next step is to move the ball back in your stance. You can use this adjustment along with choking down on the club, or you can use the full length of the club for this kind of shot. Experiment with both options to determine which works better for your needs. Moving the ball back in your stance will succeed in lowering the flight of the ball because of the reduced launch angle you will experience. The ball will come out at least several degrees lower than it would come out of a normal ball position, even without changing clubs. Also, you will decrease your backspin rate in some cases, which will again keep the ball lower to the ground. As an additional effect, your swing speed is likely to be lower through the ball, due to the lack of a full release. In the end, you are left with a flatter ball flight that doesn't come out with as much spin (in most cases). The reasons that the ball will fly lower are the same as when you choked down on the grip, but the effect will be more dramatic. Of course, moving the ball back in your stance isn't quite as simple as choking down on the grip of the club. It is still pretty easy, but there are a few things you need to watch for as you make the adjustment. Keep the following tips in mind while you practice. Don't go too far back. You can't expect to hit a quality shot when you push the ball all the way to the very back of your stance. If you have lined the ball up with your right foot at address, you have almost certainly gone too far. At some point, it is simply difficult to hit the ball solidly when you keep moving it farther and farther back. The right ball position for you will depend on the dynamics of your swing and the club you are holding. Experiment on the range to find the right spot for each of your clubs and then be consistent with your ball placement to wind up with reliable results. Consider aiming slightly left. When you move the ball back in your stance, you are going to make it difficult to square the face of the club with the target line at impact. Since the face tends to hang open on these swings, some golfers fall into the habit of missing these low shots to the right. If that seems to be the case for you, don't try to make any major adjustment to your swing – just aim a bit to the left when you move the ball back in your stance. It is easy enough to aim to the left, and this way you don't have to try to make any further changes to your swing mechanics. As you gain experience, you will get more and more comfortable with how far left you need to aim given the shot at hand. Stay balanced during the swing. Unfortunately, many amateur golfers who move the ball back in their stance make the same mistake when they actually go to hit the shot. Since the ball is to the right of its normal location, many players will sway to the right as they swing in an effort to get back to the ball. Needless to say, this is a serious mistake. When you swing away from the target, you will lose your balance and it will become difficult to hit the shot cleanly. Also, since your weight will now be back over the ball, you will lose any benefit you gained by changing your ball position. To get the desired results, you need to hold stable and make a normal swing with excellent balance from start to finish. Keep your center of gravity in the middle of your stance and strike down through the ball aggressively to find success with this shot. Moving the ball back in your stance is a more powerful way of bringing your ball flight down closer to the earth. This adjustment requires more skill and practice than the one previous, but it can offer you more benefit in the end. Work on learning how to hit low shots from an altered ball position on the range and you will hopefully gain confidence in your ability to execute this play. Once on the course, you will love the flexibility that your game has gained simply by being able to produce a relatively low shot whenever one is necessary. You may have noticed a pattern by now – our methods for hitting low shots are getting more and more dramatic as we move along. We started with the mild option of choking down on the grip to bring your ball flight down slightly. Next, we talked about moving the ball back in your stance to flatten the shot out even more. Now, at our last stop, we are going to discuss closing down the club face at address. This is the most extreme option of the three. As you might guess, this technique can help you to hit very low shots – but it can also be rather tricky to pull off properly. To be clear, you should only be trying this shot if you really need to hit the ball low – and you don't think any of your other options will work. Anytime you manipulate the club face at address, you are changing the way your swing feels, and it can be difficult to produce good shots. It should go without saying that plenty of practice will be necessary before you can round this technique into a form that will be useful on the course. If you would like to work on closing down the club face in order to produce low shots, check out the tips below for help. Aim the face at the target. When you close down the face at address, do your best to aim that club face at the target to keep the shot as close to online as possible. Of course, the ball is probably going to draw as it flies, as a result of the closed face, so you will probably need to set up with the face pointed to the target and your feet out to the right. If you were to leave your feet where they are normally and simply close the face, such a shot would almost certainly wind up to the left of the intended target. Make only a minor adjustment. You may be surprised to find how little you actually have to turn down the face in order to get the desired result. 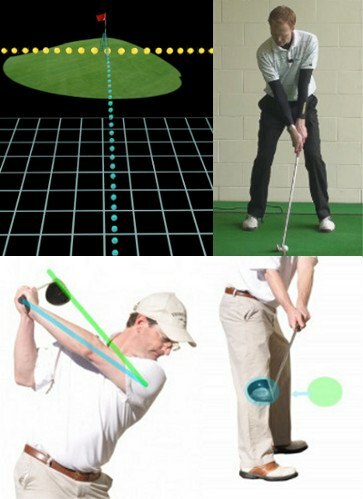 Turning the face closed by just a few degrees should be more than enough to produce a lower shot. If you close the face too dramatically, you will wind up with a shot that is so low it becomes unplayable. Also, this kind of shot would hook wildly out of control, meaning you will have almost no chance to hit your desired target. On the range, experiment with different amounts of closing the face until you find a comfort zone that works for your swing. Weaken your grip slightly. This is somewhat of an advanced technique, but it can pay off nicely if you master it during practice. Since the ball is going to want to turn over from right to left as a result of the closed club face, consider using a weaker grip during the swing to counteract that draw. The weaker grip is going to limit the amount of release you achieve through the ball, which means the shot may fly straighter in the end. Also, with less hand action at the bottom, you can flatten out your ball flight even more effectively. At first, the results you achieve with this technique will probably be a little ugly. Don't give up on it too quickly, however – it will take some time to get comfortable with how this shot works. As you progress, you will see more and more positive outcomes, and you just may be able to build it up to the point where you are willing to try it in a round. This should always be a 'last resort' kind of shot, but it may be able to bail you out when the time is right. Now that you know how to hit a low golf shot, you need to know exactly when to put such a shot into use on the course. To finish up this article, we are going to highlight a few opportunities you may find during your next round to put these low shots to the test. Playing a shot into the wind. Okay – so you already knew this would be the first point on the list. When playing into the wind, keeping the ball down is going to help you in a couple ways. First, it will prevent the wind from taking too much distance off of your shot. If you hit a full-height shot, the wind may destroy nearly all of the shot's forward momentum, causing it to come down well short of the target. Also, high shots played into the wind tend to get thrown off line, as rarely will the wind be perfectly matched with your target line for the shot. By keeping the ball down, you should be able to hold your intended line more effectively. If you play most of your golf in a windy location, having some low shots in your bag is an essential skill. Reaching a hole location in the back of the green. When the hole you are playing features a flag which has been located in the back of the green, a low shot is a great way to get back there without taking on too much risk. Trying to fly the ball all the way to such a target is risky, as hitting the ball slightly too far could result in a shot that lands over the green and bounces even further. Take the safer route by playing a low shot which will land in the middle of the green and hop back toward the cup. Hitting a narrow fairway. You probably don't often think about playing the ball low off the tee, but this can be an excellent strategy when you need to hit a narrow fairway. Use one of your low ball flights to keep the ball from getting very high in the sky and it won't have as much time to drift off line. Sure, you are going to trade out some distance for extra control with this plan, but that trade is worth it in almost every instance. When you walk up to the tee and see a narrow fairway guarded by hazards, use your low shot and keep the ball somewhere on the short grass. Hitting the ball low is an essential skill in this game. It is easy to fall into a pattern of just hitting the same shot over and over again, but there are too many variables in golf to get away with such a simple plan. Add variety to your game by learning new ball flights and then find ways to have those ball flights help you out on the course. Hopefully, the advice provided in this article will open up new opportunities for you in upcoming rounds. Good luck!